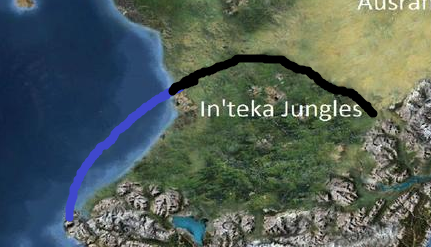 Ancestry: Seafaring orcs of the Va'ak Jungles. 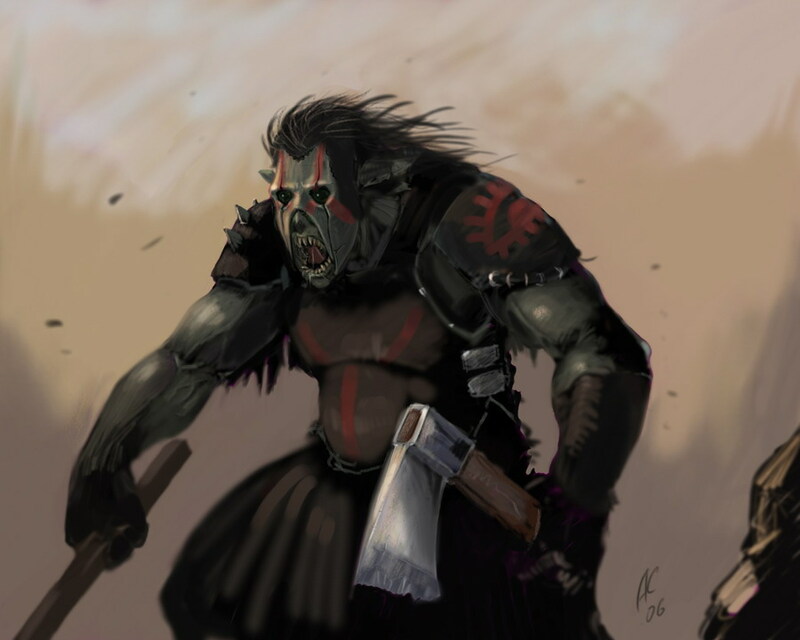 Clothing: Orcs will usually wear leather and fur pelts hunted from the jungles which they call home. For soldiers, iron armor decorated with furs and paints are the norm. Kingdom Description: Mostly undisturbed jungled save for the area surrounding the Citadel, a massive structure made of black iron and lumber that sits at the shore of Bulrok's Lake, at the southernmost end of the kingdom. The orcs have been harvesting lumber en mass, and their expansion is pushing into the rest of the continent. Where on the map are they? Culture: The culture of the Black Horde is a strong one, as you might expect from orcs. Every man, woman, and child is meant to hold their own. 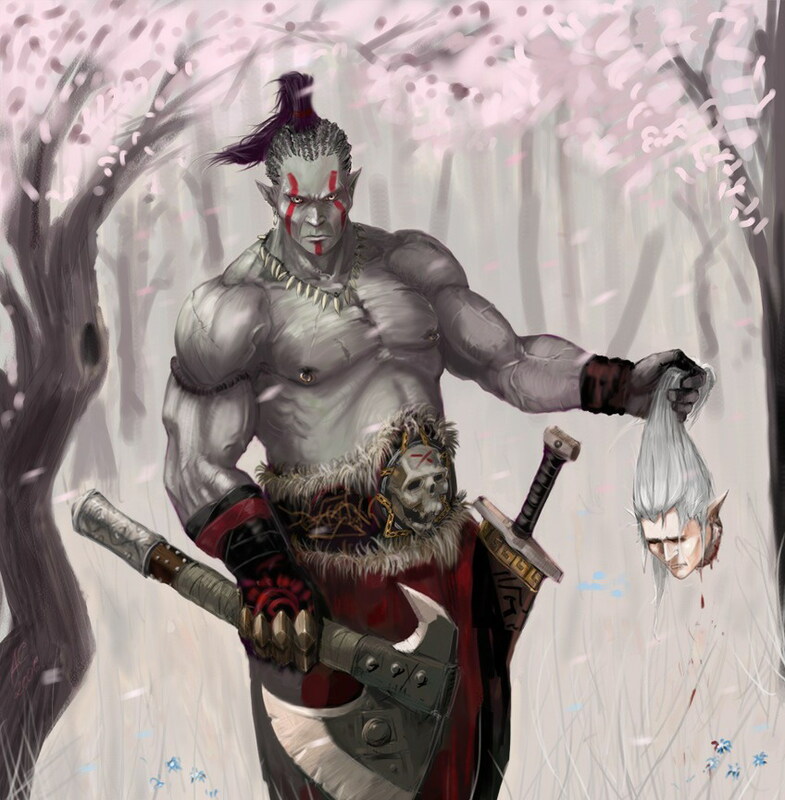 The Black Horde venerates the god Kaotika, creator of orcs and goblins, and rituals are a common practice. Music involves beating of one's body, the ground, and war drums, with ritualistic chanting. The theme of songs are mostly the horde's religion or war. The Black Horde has no written language, believing written language to be a weak human and elvish custom, and trusting in their own, rich oral tradition to continue to pass down the Horde's history. The Horde's leader, Blade Master Tar'bok the Stout, rules his Horde with an iron fist in order to reign in any riots and keeping every orc's loyalty strong. With the close proximity of the elves to the northeast, orcs have made it a common practice, almost a sport, of hunting them. In the Black Horde, elves are considered game first, and neighbors second. An albino orc with elf head in hand. History: A brief history of your kingdom. Religion: The Black Horde's religion revolves around the worship of Kaotika.